Mystery Lovers' Kitchen: That's What Kind of Soup? That's What Kind of Soup? Now for something different. I know what you're thinking—what's new about tomato soup? Hah! 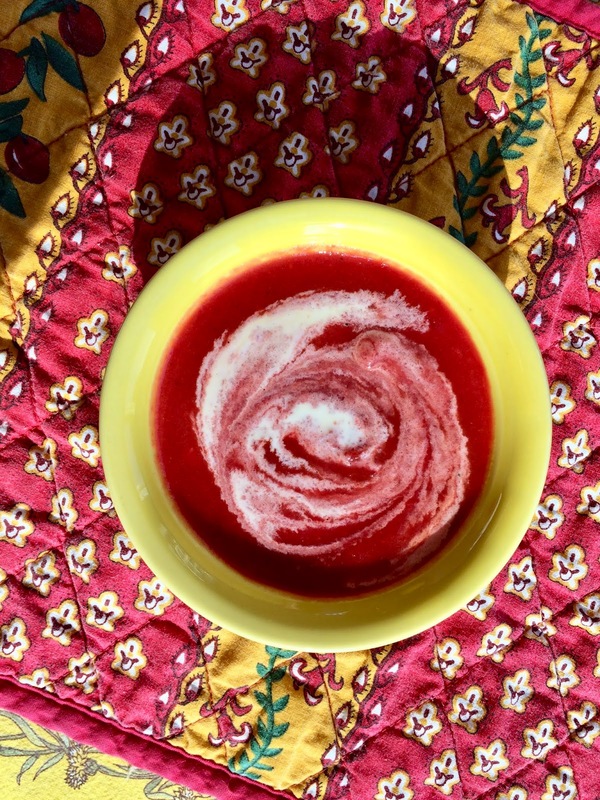 This is Carrot, Beet, Apple Soup! It's chock full of the things we're supposed to be eating. And it's such a lovely bright color. It won't be everyone's cup of soup because it leans to being sweet. You could certainly add salt, but the nature of the ingredients is just plain sweet. I gave it a whirl with my handy dandy immersion blender, but you could accomplish the same thing with a regular blender. I didn't make it completely smooth, but it's smooth enough to pour into a mug and drink. Note that I also added a little cream to the bowl. I think it would be great with a dollop of sour cream as well. Melt the butter in a large pot over medium heat. 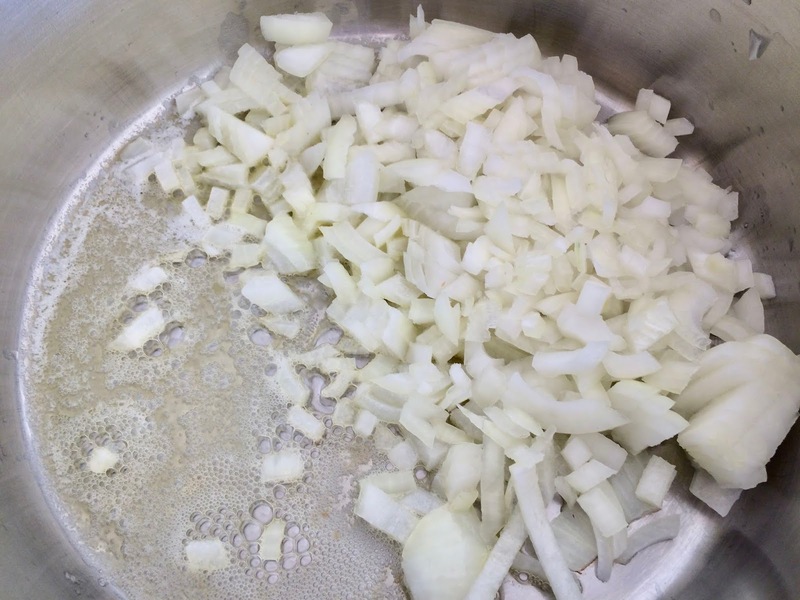 Chop the onions. Add the onions, thyme, and sage to the pot. Stir occasionally. Meanwhile peel and slice the carrots. Add to pot. 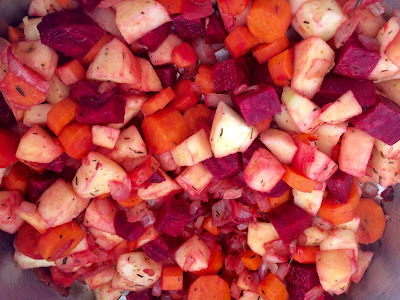 Peel and slice the beet into chunks. Add to the pot. Peel and core the apples, cut into chunks, and add to the pot. Pour chicken broth over it all. Bring to a boil and immediately turn down to a simmer. Cook for at least an hour. 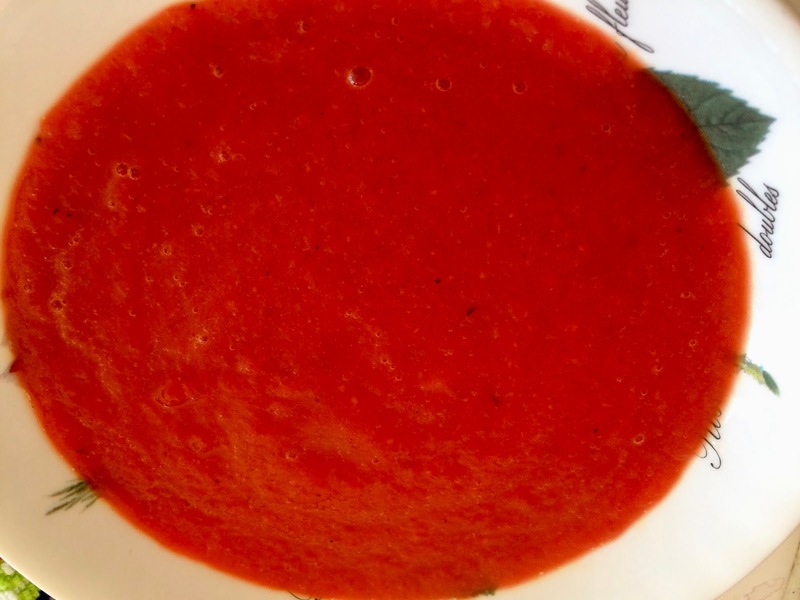 Use an immersion blender to blend everything together. Ladle into bowls and garnish with heavy cream or sour cream. Look how they separated while they simmered! 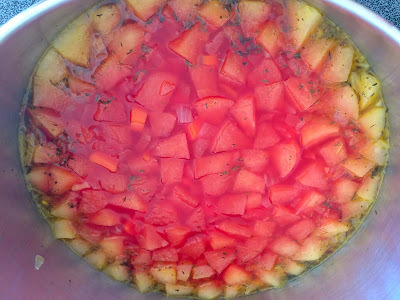 Blend all the chunks together. A lovely warm lunch on a winter day. It's such a beautiful, vibrant color! It doesn't sound like a soup for me, though, as I don't care for beets. Or carrots. Haha. Thanks for sharing your recipe, Krista! 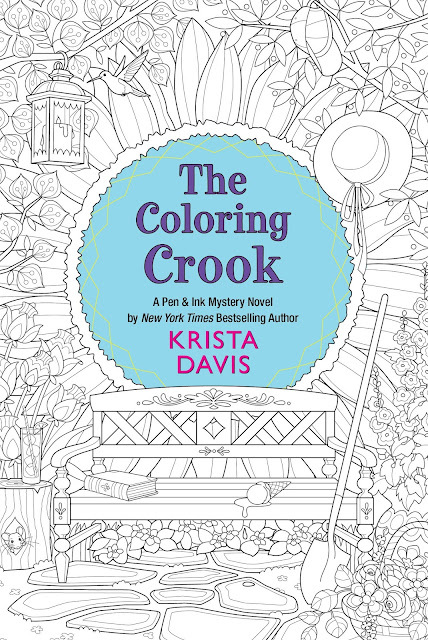 So excited for the release of The Coloring Crook! I don't mind trying sweet soups. Love the shot of the vegetables and apple separated while simmering. Isn't that odd? They must have different weights. 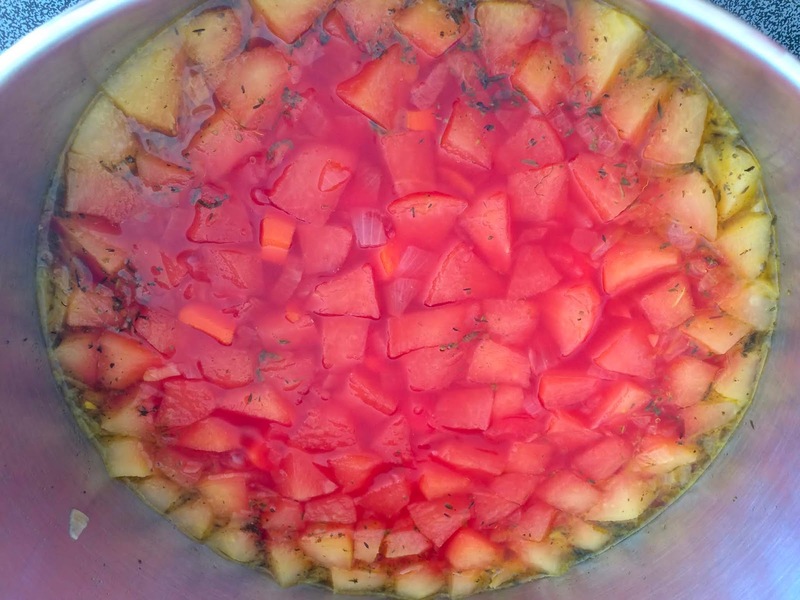 This is a gorgeous soup, Krista. 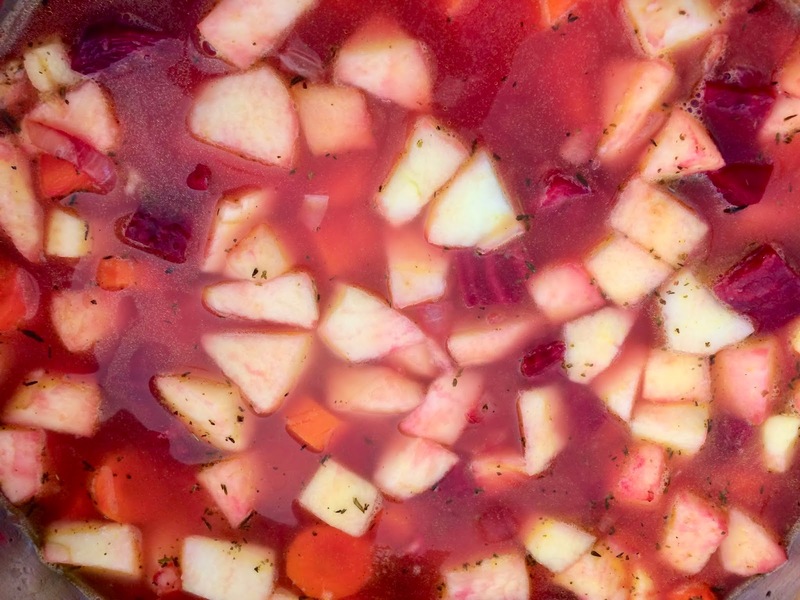 Marc and I are fans of borscht, so I know we'll love this. Have a great week! Thank you, Cleo. You might like this if you're fond of borscht! So pretty! Any excuse to use our immersion blender -- we call it the whizzy-uppie thing -- is welcome! That's a far better name for it, Leslie! 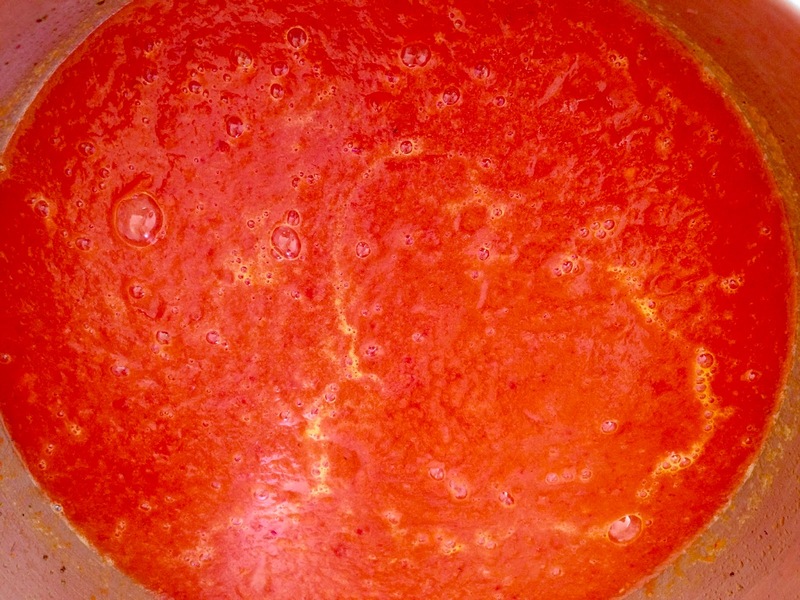 A jewel toned soup. Lovely and tasty. It *is* a jewel tone! It would be so pretty served at Christmas in little cups. Sounds good. Love beets. And carrots. And apples! Oh, my! It's very filling and got a thumbs up from my mom! That sounds really good! Would it be good leaving the chunks and not blending it?